The comments from students provide a window into the problems with the internship. It appears that these students have a lot to unlearn. Worse, they don’t seem to know it. Mr. Barton showed us the Quran that was actually printed in 1803, I believe, by Jefferson after the Barbary wars, and the thought, the idea that the leaders of the country would not only say, hey, this would be a good idea to learn but they encouraged promoted that to learn about people who were different, to learn, not that they were terrible people, not slandering them, but saying this is who they are, this is what they are about. That is a completely different approach to knowledge and truth than we have today. My point is not to fault Sonja for her fact problems but to fault her teachers for providing a completely misleading narrative (which Barton has used before). Sonja has been misled on two important points. Jefferson did not print a Quran in 1803 or any other year. The leaders of the U.S. didn’t print a Quran, so they couldn’t have encouraged the public in the manner described. There’s something specific about that struck me that was unusual. It wasn’t Congress or anybody around Jefferson that said, ‘hey, we are going to print these excerpts.’ They printed the entire thing, without comment in it. They just said, ‘you need to read this whole thing.’ That is not what we do now. I challenge Barton or Beck to provide a primary source supporting the claim that Congress or Jefferson had anything to do with the 1806 edition of the Quran. I will apologize and remove this post if they can do that. Beck titled his segment, Mercury One Arms New Generation of Leaders With Truth-Detecting Tools. Unfortunately, if today’s broadcast is any indication, these students have been disarmed. They won’t be able to be effective because they are now confidently misinformed. Because of the video, we know who is responsible. I also invite any of the students to contact me about their experience. Prior to the 1920s, students completed school through eighth grade and each year had to pass a written exam that involved understanding the Declaration of Independence, the U.S. Constitution, George Washington’s Farewell Address and their state constitution, Barton explained. The older system of education was called “spiraling” because students would revisit the same topics while expanding on them each year. Today, students learn history in discrete chunks with the “tri-division” method, studying Christopher Columbus in one grade, the Civil War in the next, and so on, Barton asserted. Because students are learning their history piece by piece, they never go back to the same period again and don’t retain the information in a real way. In response, historian John Fea provided a citation from 1917 which contradicts Barton’s claim. Surely a grade of 33 in 100 on the simplest and most obvious facts of American history is not a record in which any high school can take pride. The traditional age for beginning Latin is about fifteen and the average for entering college is nineteen. Nineteen would be old for an eighth grader. The 1892 Committee of Ten (convened by the National Education Association) recommended that all school districts provide instruction through the 12th grade. Graduating high school students wanting knowledge of history could consult this list of books or attend a college with a good history program (write and ask, I can name several). *Early in American education, many students only went through 8th grade in anticipation of entering the work force. Barton’s contention that students went to school through 8th grade has some truth to it. However, college was not the end result for most of them (on Beck’s audio, Barton claimed students just went on to college after the 8th grade). We’re just going through an audit and I said to, Mercury One, I want the toughest auditors you can possibly find. Now that’s Mercury One, I’m not even on the board of Mercury One but I went to the board and said, ‘you guys should have the toughest audit and I want to see every page ’cause I’m raising most of the money for you. I want to see every page. And if there’s something wrong, I want the audience to know. If there’s something right, I want the audience to know. I think they should publish it on the website. We have to be transparent in everything we do and that means you too. The audit may be in part a reaction to my recent articles about changes at Mercury One. Mercury One changed their donation allocation policy to avoid designated funds. Now all donations go into a general fund which may be spent as the leadership decides. An issue which may have raised the need for an audit is the question about what David Barton did with the $104,000 given to him by Mercury One while Barton served as board chairman. Mercury One gave Wallbuilders (Barton’s charity) $204,000 in 2014 and 2015 combined. The IRS 990 reporting form for one of those years said Barton used the funds to help people with “unforeseen disasters.” Historically, Wallbuilders has not been engaged in disaster relief. On transparency, I have asked Mercury One several questions but there has been no response. If Glenn Beck wants to be transparent, he could start by getting David Barton to acknowledge academic fraud. Over six months ago, Barton claimed on camera that he had an earned degree. As it turns out, the degree was given by a diploma mill. He could also have Barton admit that he never played Division One NCAA basketball for Oral Roberts University. If Beck really wants transparency, he could start with Mercury One’s chairman of the board. Beginning in March 2017, Mercury One is streamlining the way we receive and allocate donations. Now, all gifts will go directly to Mercury One. We want to be able to respond more swiftly, and to do this, we are consolidating future gifts to a single account so we can be more nimble and react immediately when a need arises. Up until recently, that fund has been dedicated to rescue and restoration of refugees. I asked Mercury One how much money was left in that fund but I did not get a reply. While it is good that the caption has changed, it seems odd that the Nazarene Fund page is still active. 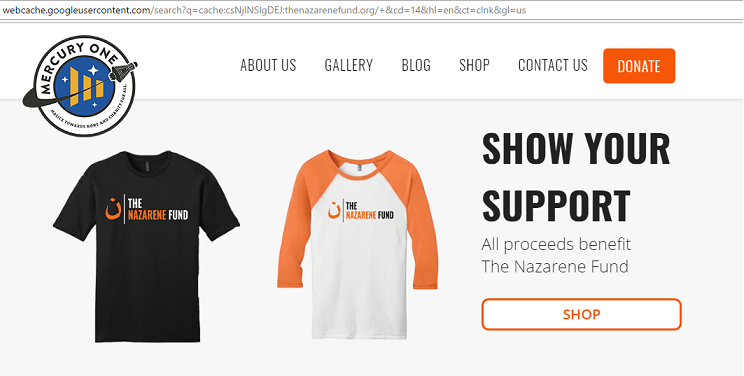 Is there a dedicated Nazarene Fund or not? According to the new donation allocation policy, there is only one account. However, having a page advertising specific activities associated with a specific fund implies that donations to that page will go toward the purposes of that fund. If the new policy is truly in effect, then donations made from the Nazarene Fund page could actually go to some other purpose. The longer this stays up, the more likely it is that donors could question how donations given as a response to this solicitation have been used. 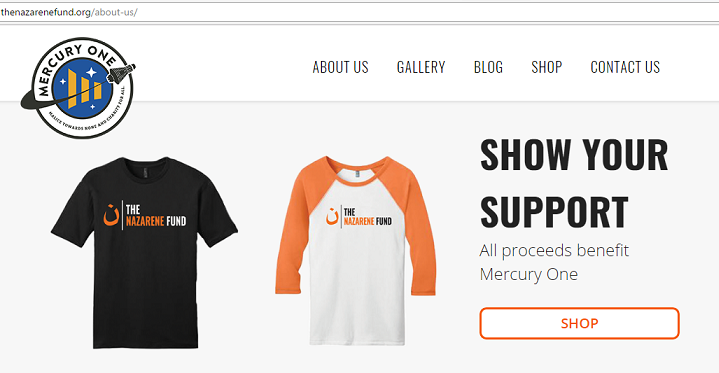 Changes at Mercury One: Should Donors Be Concerned? Mercury One is a non-profit humanitarian organization founded by Glenn Beck about five years ago. The main thrusts of the organization have been education, disaster relief, veteran assistance, and humanitarian assistance to refugees. 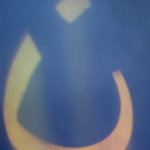 As a part of Mercury One’s mission, the Nazarene Fund was created to fund the rescue of Christians refugees from ISIS held territories. If the reports of rescues and refugees restored to safe places are accurate, Mercury One has performed a valuable service within a short period of time. However, there have been some red flags along the way. In the past, Mercury One has reported grants of $100,000 (2013) and $104,000 (2014) to David Barton’s Wallbuilders organization. In 2014, the stated reason for the grant was “to provide help and resources to individuals affected by unforeseen disasters.” (see the 2014 990 on page 82). It isn’t clear at all what disaster relief they supplied to anyone. Furthermore, what makes the grants of concern is that David Barton is the chair of the board of Mercury One. He oversaw the granting of $204,000 to himself via his position at Mercury One. As I have written in the past, donors who hoped their funds would go to actual disaster relief may be surprised to learn that a large sum of money didn’t go there. If you have supported Mercury One in the past, or have followed our journey through Glenn Beck, you may know that for each need, we created a separate funding campaign so that we could allocate every penny of your gift to support each specific initiative. It has been amazing to see the outpouring of passion and support for these projects, but it also prohibited Mercury One from immediately distributing funding quickly when a new and urgent need arose. Donor intent is very important to us. 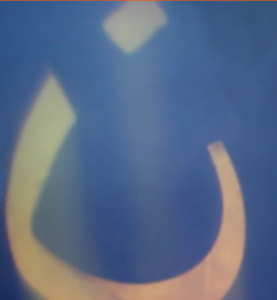 We have been extremely honored to be able to partner with you, our donors, to make an impact in the world, whether it be to support disaster relief, veterans, those in crisis through our grant programs, or assisting Christians and other persecuted religious minorities in the Middle East. Our mission remains constant. We will continue to support humanitarian aid and education initiatives throughout our nation and the world. What is different, is that we will no longer raise funds for single projects nor for a General Fund to support daily operations. What stays the same is that Mercury One will continue to be conservative in our administrative spending and open with our hearts as we provide assistance to those in need. I can’t see a reason why Mercury One would have been unable to take funds designated generally for disaster relief and use them in a crisis as needed. In fact, it appears that Mercury One has a history of responding very quickly to natural disasters (e.g. Texas, West Virginia). While I can’t be sure, the reasoning that they have been hampered by having restricted funds doesn’t make sense to me. We will continue to support humanitarian aid and education initiatives throughout our nation and the world. What is different, is that we will no longer raise funds for single projects nor for a General Fund to support daily operations. What stays the same is that Mercury One will continue to be conservative in our administrative spending and open with our hearts as we provide assistance to those in need. While they pledge to continue fund humanitarian projects, the organization is not now locked into any specific level of support. Mercury One could fund one humanitarian project and put the rest into educational projects. Furthermore, they promise to be conservative in administrative spending but now there is no limit as there was before when they could only spend money given to the General Fund for admin purposes. This change of allocation should be a red flag to donors. Two examples of other charities moving from restricted funds to one unrestricted fund come to mind: Mars Hill Church and Gospel for Asia. 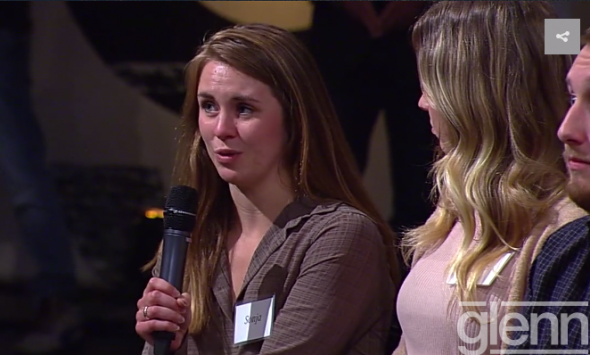 In the case of Seattle’s Mars Hill Church, at one point in time, donors could donate to their general operating fund or to a mission fund (they called it the Global Fund). When I discovered that the Mars Hill Church leadership was using restricted mission funds to help build their domestic network of churches, Mars Hill decided to remove the option of designating funds just for international mission work and make all donations unrestricted. While the flexibility of the church leaders to spend money how they wanted was increased, the accountability to donors was decreased. When one gives to an unrestricted fund, one has no control over how the funds are spent. 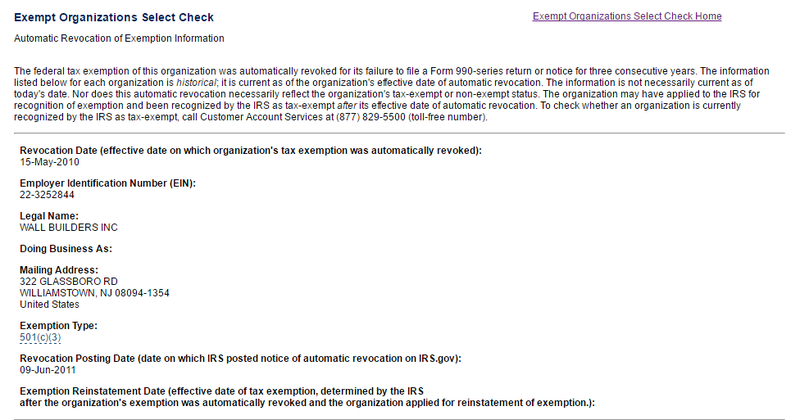 If the non-profit doesn’t make their financial statements available, donors won’t ever know how those funds are spent. Another example of a charity which promised to honor donor intent but did not is Gospel for Asia. GFA is the target of two class action lawsuits alleging fraud. There are many examples of GFA not following donor intent, but I will mention only one of them – the $20-million gift from Believers’ Church to Gospel for Asia to build a new compound in Wills Point, TX. Those funds had originally been given by donors to go to the mission field. However, it appears that $20-million eventually came back from India to help complete construction of GFA’s Wills Point headquarters. Since these shenanigans have been reported, GFA now implies that all funds are within GFA’s discretion and control. In practice, as these cases show, restricted fund giving doesn’t guarantee that a charity will honor donor intent. However, at least there is some basis for accountability if a charity strays from that standard. Perhaps the left hand doesn’t know what the right hand is doing at Mercury One. In any case, the newest word as of March 13 is that all donations will be unrestricted permitting the leaders (remember David Barton is board chair) to spend the funds as they please within the broad mission of the organization. That museum could be just around the corner. 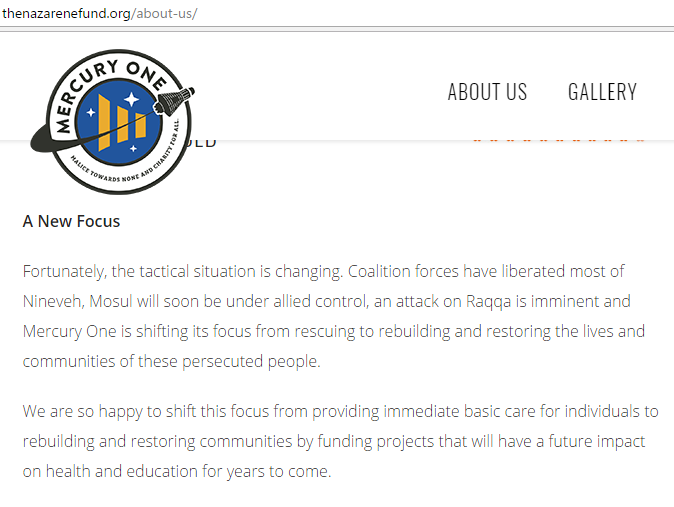 Despite the posting about a change in donation allocation, Mercury One is still advertising the Nazarene Fund. Today, donors could give to the Nazarene Fund and think their gifts would go to rescue and restore refugees. However, if the donation allocation blog post is correct, it is unclear that a donation to the Nazarene Fund would go to that purpose. I am always suspicious of a charity which markets a fund in a way that makes it seem restricted, but in another part of the website or materials says that the funds are unrestricted. 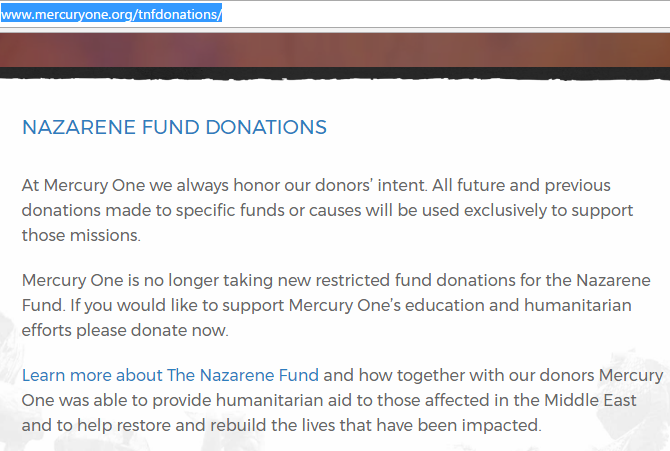 Until Mercury One clarifies things more, I would be cautious and not assume that Nazarene Fund gifts will be used for rescue and restoration of refugees. Author Warren ThrockmortonPosted on March 14, 2017 Categories david barton, Glenn BeckTags david Barton, glenn beck, Mercury One, Nazarene FundLeave a comment on Changes at Mercury One: Should Donors Be Concerned?